condo, south haven, swimming pool, shared deck, bedrooms, stainless appliances, wood flooring, granite counter tops. 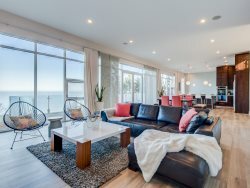 If shiny, new, and fresh are on your wish list for a summer rental, then this North Shore Condo is for you. The interior is modern and open with stainless appliances, granite countertops, and beautiful flooring as well as sunny and bright with a large window. The bedrooms are cozy with nice linens and updated furnishings. The bathroom is clean and bright with modern tile floor. North Shore Condos have been a customer favorite for many years due to its lovely grounds and perfect location. Located right on our Lake Michigan shore, enjoy your semi private beach, large sunning and dining deck, as well as the large heated swimming pool for cool dips throughout your stay! Add in Private Parking and Bike Racks for additional guest convenience. Guests tell us all the time that they love these condos for their family vacations because they can park the car and walk everywhere. It's true! Short strolls take you to Bunde's Bakery, Sherman's Ice Cream, Maritime Museum, Stanley Johnston Park and Playground, and the entire Downtown area of South Haven.